For a casually elegant getup, make a black coat and black leather skinny pants your outfit choice — these two items a work setting really great together. Complement your outfit with black suede pumps. Contrary to what you might believe, looking elegant doesn't take that much time. Just consider wearing a red coat and you'll look incredibly chic. When it comes to footwear, this outfit is round off nicely with black suede pumps. If you're on the hunt for a casual yet absolutely stylish look, wear a black long sleeve t-shirt with navy flare jeans. Both of these pieces are very comfortable and they will also look stunning paired together. Perk up your outfit with Victoria Beckham pointed toe pumps. If you're hunting for a casual yet incredibly chic look, marry a grey tweed jacket with grey sweatpants. Both of these items are totally comfortable and look wonderful when worn together. 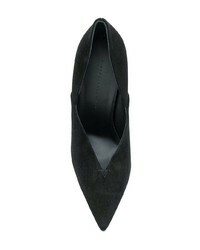 Elevate your outfit with Victoria Beckham pointed toe pumps from farfetch.com. If you're scouting for a casual yet seriously chic look, marry a burgundy gingham sleeveless top with white and black vertical striped wide leg pants. As well as super comfy, these two items look great when paired together. Sporting a pair of Victoria Beckham pointed toe pumps from farfetch.com is an easy way to add some flair to your ensemble. If you're on a mission for a casual yet seriously stylish getup, choose a red cardigan and a dark green pleated midi skirt. These two pieces are totally comfortable and look wonderful paired together. When it comes to footwear, this getup pairs nicely with black suede pumps. As you can see here, looking totaly chic doesn't take that much time. Just rock a dark green sheath dress and you'll look amazing. When it comes to shoes, this ensemble pairs nicely with Victoria Beckham pointed toe pumps from farfetch.com. If you're searching for a casual yet incredibly chic ensemble, go for a black leather biker jacket and a pink skater dress. As well as very comfortable, these two pieces look great when worn together. Let's make a bit more effort now and throw in a pair of Victoria Beckham pointed toe pumps.